The new parliament building in Georgia is magnificent, eye-catching and distinct yet with a complex design with its main element resembling a white scarf twisted around a giant glass dome. Featuring Fibrobeton on its exterior façade, the project was delivered with Fibro- Multiform® Technology which can be applied “to deliver any desired form of architecture”. 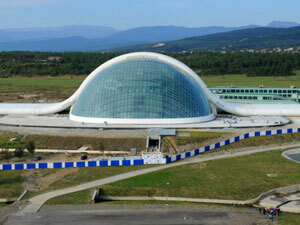 Involving firms from Spain, Turkey and Japan, the solution partner of this multinational project has become Fibrobeton. The harmony of Fibrobeton products with steel and glass material on the facade was once again demonstrated with this complex design. 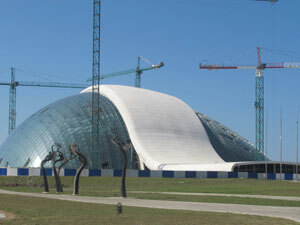 Inclined panels of different forms manufactured with Fibro-Multiform® Technology were used in the interior and exterior cladding of the Voile band in harmony with the glass dome placed on the supporting steel construction. For the project a special production was delivered on an area of 19,000 square meters by manufacturing 1,000 different molds at Fibrobeton Düzce Plants.